The picture below captures everything I did today, and it doesn't look like much. 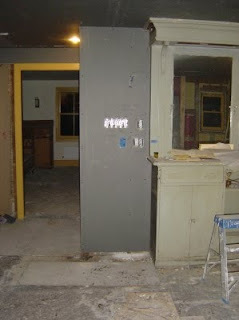 Look at all the light switches on the wall, it takes quite some time to measure and cut it all out. In the background the trim around the door to the Stube was comparatively easy. E! was very busy weatherizing the windows all around. With the cold wind blowing around the house it is easy to identify problem areas. Maybe we should apply for funds from the Federal Weatherization Program. 1) you are an insomniac. That of course demands a special song: Der Königsjodler (The King Yodeling), by Fredl Fesl.